Scientists have modeled a giant tsunami, after which dinosaurs became extinct. The fall of an asteroid with a diameter of about 14 kilometers, probably provoked a tsunami almost 1.5 kilometers high in the Gulf of Mexico, which caused chaos in the oceans, according to research results. The giant tsunami was not the only consequence of the fall of the asteroid. It also caused shock waves and the ejection into the atmosphere of a huge amount of burning stones and dust, which provoked forest fires and left the planet for a long time without sunlight. Scientists, based on the fact that the asteroid fell in shallow waters in the Gulf of Mexico, created a model that demonstrates in detail what happened in the waters of the bay within 10 minutes after the fall of a celestial body, which resulted in a crater about 1.5 kilometers deep. In the second model, the researchers showed how the tsunami spread across the planet. The simulation results demonstrated that the effects of the tsunami were felt throughout the world. So, in the Gulf of Mexico, the wave moved at a speed of 143 kilometers per hour, during the first 24 hours a tsunami covered the entire Atlantic. At the same time, the first wave reached a height of almost 1.5 kilometers, and in the South Pacific and North Atlantic, the waves reached a height of 14 meters, the researchers note. In the northern part of the Pacific Ocean, their height was 4 meters, and in the Gulf of Mexico – 20 meters in some places and 100 meters in others. For comparison, the largest modern wave ever recorded in the Southern Hemisphere was about 24 meters high, LiveScience notes. According to Molly Range, one of the authors of the study, a leading researcher at the University of Michigan (USA), this experiment is the first of its kind when a global simulation of a tsunami caused by a falling asteroid is conducted. In addition, scientists compared the power of this tsunami with the disaster in the Indian Ocean in 2004, when as a result of prices, at least 225 thousand people died. “During the first seven hours of both tsunamis, the impact of the Chicxulb tsunami was 2.5 thousand – 29 thousand times stronger in energy than the tsunami in the Indian Ocean in 2004,” Range said. 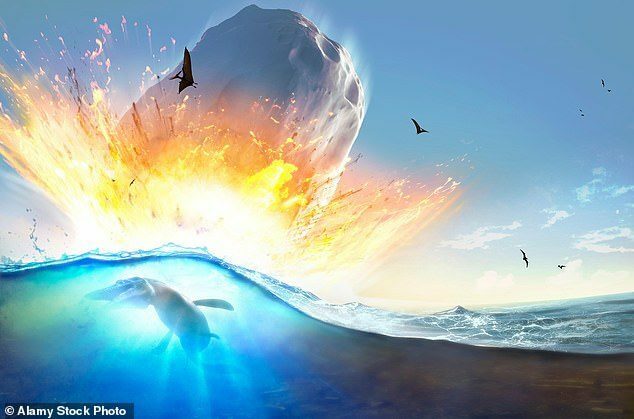 Cretaceous-Paleogene extinction – one of the five “great mass extinctions”, which occurred about 66 million years ago. Part of this mass extinction was the extinction of dinosaurs. In this case, the scientific community prevailed the view that the cause of this event was the fall of the asteroid.